When I started food blogging I found plenty of advice designed to steer the novice away from the more common and pernicious sins associated with bad food writing. One of the most commonly encountered pieces of advice cautions against simply describing your food in terms of vague qualitative adjectives. Basically, nobody’s captivated by writing that says “this is really delicious.” But, like all rules (especially those associated with writing), exceptions need to be made. Hopefully you’re asking yourself why I’d feel the need to point that out. After all, one would hope that all the food I post here is delicious. Nobody wants to read a food blog called Mediocre Eats. But there’s a word right there in the title that has become a bit of a culinary buzz-kill. I’m talking about the word ‘poached.’ Specifically when that word is attached to a meat. Poached eggs may be the current darlings of the brunch/breakfast scene, especially if you can capture a photo of a creamy golden yolk oozing out onto the plate, but poached meat has a rather unfashionable reputation. Boiling meat is simple enough, and it can be a good way to tenderize a tough piece of meat. This made it a popular middle-class cooking method in Europe and North America, especially in the lean post-war years where good meats and tender vegetables were scarce. But boiling food can be problematic – it leaches a lot of flavour out of the food and into the water. It’s also very easy to overcook a meat in boiling water, yielding a dry and mealy disaster. Baby boomers grew tired of bland boiled meat, and even more tired of horribly over-boiled vegetables, and culinary tastes shifted towards other methods of preparation. But perhaps poaching (which is really just a very careful, fancy way of saying ‘boiling’) is poised to make a comeback. After all, sous-vide cooking (which, thanks to increasingly adventurous home cooks, has made the leap from Michelin-starred restaurant kitchens) is effectively just a VERY controlled form of poaching, albeit with a barrier in place designed to prevent flavour from leaching out into the pot. But even if you don’t want to cook a steak in a bag for 9 hours using a thermostat, you can learn a lot about poaching from sous-vide cooking. I bring all this up because, I encountered a particularly intriguing approach to poaching from a wonderful book all about Chinese Hakka cooking, which I’ve adapted here. Now, I don’t think it’s a stretch to say that lean chicken breast tossed in a pot and boiled to perdition will not make for a good meal. But this is not that. This was one of the most tender chicken breasts I’ve ever tasted, and it was astonishingly easy to achieve. There are two tricks to success here – flavoured poaching liquid, and controlled temperature. The first bit is easy enough to understand – ginger, star anise, and pepper all contribute distinct but subtle flavours to the chicken. But it was the second trick that threw me a little. Basically, you bring the water to a boil, throw in the chicken, then turn it all off and let it cook slowly. You don’t actually boil the meat – you just let it stand in really hot water. At first the idea seems odd – we associate boiling with sanitation and proper cooking, but, sous-vide cooking clearly demonstrates that food doesn’t just start magically cooking when water is above 100°C. But cooking chicken this way was interesting for another reason – as I often do when testing out new recipes, I checked the temperature of the chicken with a thermometer while it cooked, and I was a little surprised by the way it looked when it was fully done. To put it simply, the chicken was a tiny bit pink. Now if there’s a pair of words that sends both diners running for the hills, it’s ‘pink chicken.’ But oddly enough, perfectly cooked chicken breast can actually be a tiny bit pink, especially when it’s been poached. The thermometer doesn’t lie. The same is true of a good pork loin – when it’s perfectly cooked, it actually looks just a little bit underdone. Of course this is all about perception – we’re used thinking that chicken is only safe if it’s as white and dry as a conversation at the country club. But take a look at the photo – it really is a little bit pink, and incredibly succulent. If I’d kept them in the water much longer or boiled the water, I’d have ended up with something a lot paler, and much less texturally pleasing. If you have any misgivings about this style of cooking, I really do hope you’ll give it a shot and see just how easy and rewarding it really can be. The chicken is wonderful (just use a thermometer if you’ve got pink-trust-issues), the sauce is easy and packed with flavour, and the greens are so easy to prepare that it barely counts as cooking. The whole thing makes for a memorable and remarkable Chinese dish that… well, that tastes really delicious. I know I spent a lot of time talking about the chicken, but I don’t want to sell the sauce or the choy sum short. The sauce is what makes this dish, so take the time to prepare it carefully. It’s quite simple, but if you get the size of the garlic or ginger wrong, you’re not going to get a great result. The garlic can be minced by hand, but the pieces have to be equal in size. Big pieces won’t cook enough while small pieces will burn. If you don’t want to dice the garlic, a garlic press does a great job. The ginger also needs to be minced to an equal size, and this must be done by hand. Grated ginger will be much too wet and will spatter badly in the oil. This is best achieved by slicing the ginger thinly, julienning the slices, and chopping the resulting sticks of ginger. As for the choy sum, it makes an ideal partner because it’s relatively mild, softens nicely when poached, and works really well with the sauce. If you can’t get choy sum, you could use gai lan or even bok choy. 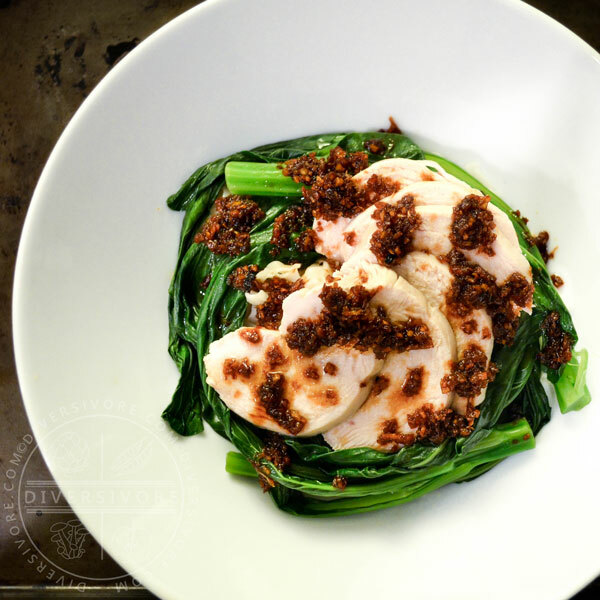 If you use gai lan, you’ll want to poach it a little longer and/or cut the thick stems in half to speed up cooking. If you use bok choy, you might want to use halved baby bok choy for a nice presentation. Regardless of the vegetable you use, take care not to poach for too long. You want a vibrant, fresh, still-crisp taste, not a soggy disintegrating mush. For more tips on blanching and dressing greens, you can read part 3 of my 3 part series on universal Chinese vegetable cooking methods. Unless you use very thick chicken breasts, this preparation method should work very well. That being said, if you’re nervous about trying it, or you’re concerned about the colour, use a meat thermometer to make sure that you get to the ideal temperature. Note that I’ve indicated that this dish is gluten-free, but that may depend on your soy sauce choice (most soy sauces contain wheat, but many are still gluten-free). When in doubt, you can always substitute tamari. It’s a byproduct of making miso, and it’s generally both gluten- and wheat-free (consult the labels – some are made with a bit of added wheat). GOOD NEWS:Low in calories and fat and exceptionally high in nutrients, this dish also benefits from a very healthy cooking style. Note that the nutritional information does NOT include rice or noodles. BAD NEWS:The soy based sauce makes this a little higher in sodium. If you pair this with noodles, be careful; some dried noodles can be very high in salt, sending this dish over the top. Combine the water, sliced ginger, star anise and black pepper in a large, heavy pot. Be sure to use the amount of water indicated, as the chicken may not cook properly in a smaller volume. Bring the water to a boil. Add the chicken to the water and return to a boil, then remove from heat and cover. Let stand until the chicken is cooked through -- about 20 minutes. Test for doneness by checking the temperature in the thickest part of the breast, or by cutting into a piece. The meat should appear moist and VERY lightly tinged pink. Once the chicken is cooked, set it aside and return the water to a boil. Add the choy sum to the boiling water and cook until the stems are softened -- about 2 minutes. Remove the greens from the water and drain, rinsing briefly with cold water. (Optional) If you're serving the meal with noodles, cook them in the same poaching liquid for extra flavour. Combine the soy sauce, cooking wine, and sugar and set aside. Heat a wok (or large pan) over medium heat. Add the vegetable oil and let stand for 1 minute. Once the oil looks hot, add a tiny pinch of garlic to see if it sizzles. If it does, add all of the ginger and garlic and cook, stirring frequently, until the garlic is golden brown. Add the soy sauce/wine/sugar to the wok, stir the ingredients together, and immediately pour the sauce from the wok to a bowl. Set aside to cool slightly. Serve the chicken and choy sum (with noodles or rice if you like), drizzled with the the sauce. Be sure to get lots of little pieces of ginger and garlic in there, and not just the liquid. The garlic can be minced by hand, but the pieces have to be equal in size. Big pieces won't cook enough while small pieces will burn. If you don't want to dice the garlic, a garlic press does a great job. The ginger also needs to be minced to an equal size, and this must be done by hand. Grated ginger will be much too wet and will spatter badly in the oil. This is best achieved by slicing the ginger thinly, julienning the slices, and chopping the resulting sticks of ginger. I think some food blogger needs to come up with a very long list of synonyms for delicious, don’t you? I love poached salmon, but I’ve never poached chicken before. Poaching just may be the answer I’ve been seeking for avoiding dry chicken breasts! I think you’re very right Elaine. I love writing, but I find I struggle the most when I try to actually DESCRIBE food! And I do hope you’ll give this poaching method a try – I was really pleasantly surprised by how stunning the results were. Nice recipe Sean ! I usually bake or fry my chicken breast, this is a great healthy way of cooking it. Choy Sum is also one of my favourites ! This is good, delicious, yummy, scrumptious, tasty, mouth-watering, savory…..(that’s pretty much my whole vocabulary for delicious …..lol !) Thanks for sharing ! Hi Sean brave of you to try the poached chicken breasts. By the look of the chicken you nailed it. A nice pink color and juices showing. Well done it takes great skill to cook this way. I live the choy for the base. Such a succulent green and flavorful. Great dish and great write up as usual Sean. Love the info and this is truly a delicious dish! Lol. Thank you so much Loreto! It’s funny, so many people would look at that chicken and think it was underdone – we’re just so afraid of any pink showing at all. But it’s so much better when it’s cooked just right like this. Thanks for coming by, and thanks for commenting! Hah, I’m glad you approve Justine. This style of Chinese cooking is really quite delicious, but seriously under-appreciated. Thanks for reading, and thanks for commenting!